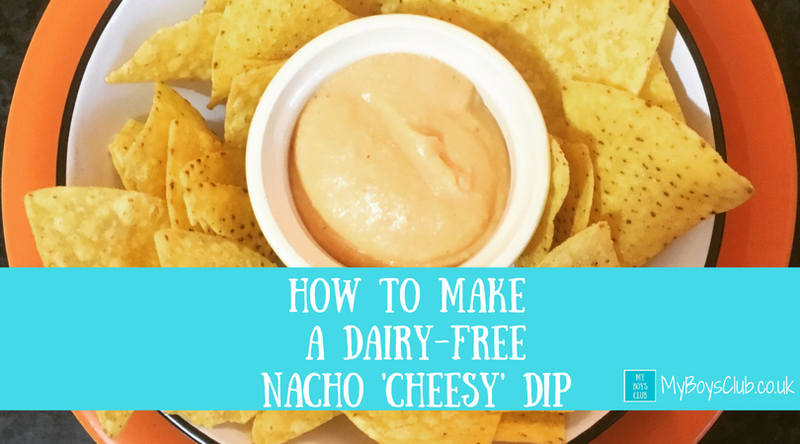 If you are looking for a dairy-free alternative to a cheesy nacho dip then try this recipe. 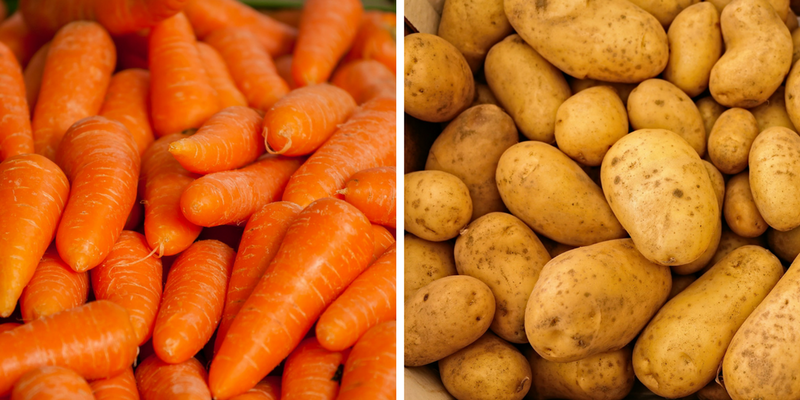 It's basically a carrot and a potato and a few ingredients out of the store cupboard. Honestly, it's that easy. It's also dairy-free, gluten-free and suitable for vegans too. I’m not the biggest fan of Nacho Cheese that you buy at places like the cinema. But I do love eating nachos and having some tasty dips with them. We love salsa, guacamole but have never been able to recreate the cheese taste in a dip. 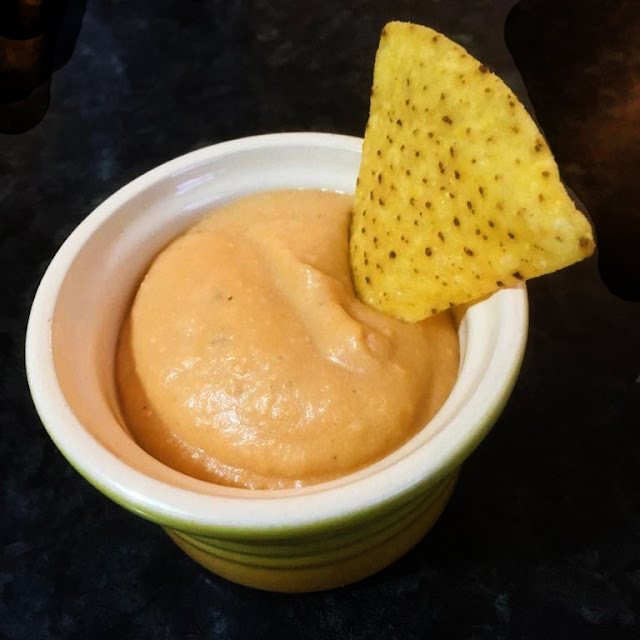 We are not vegan the whole time, but as both a healthier option and as a way to feed our dairy intolerant friends snack food we’ve been making a Nacho cheesey dip that’s both dairy free, gluten free and vegan. It is also a great way to ‘hide’ vegetables in food if your kids think they don’t like vegetables. The first time I made this I didn’t tell the boys what it was. That it was basically carrot and potato. I just called it a cheesy dip, and put it down in front of them, and it lasted only a few minutes. Even once they knew what it was, that it was carrot and potato, they wanted more. Even celebrating that their dairy intolerant friend would also be able to enjoy it. Now it isn’t cheese and it certainly doesn’t look or taste like hard cheese. It's more similar to a cream cheese, however as a hot cheesy dip for nachos it is pretty perfect. It’s nutritional, tasty and cheap. It also only takes 10 minutes to make and costs approximately 25p for enough to fill three ramekin dishes. Peel and cube the potato and carrot. Place in a saucepan, cover with water, bring to the boil and simmer for 10 minutes. After 10 minutes, drain and add to a food blender. Add the other ingredients and blend until smooth. Serve with your favourite tortilla snacks. You can make it more spicy by adding more chilli or sliced Jalapenos. I'm also tempted to try it with sweet potato instead of potato but haven't done that yet. I've also heard its a great alternative to use in a dairy-free version of macaroni cheese too. It has got to be said that Nutritional yeast does not sound that appetising, I much prefer other names it goes by Nooch and my favourite ‘hippie dust’. It has a strong flavour that is described as nutty, cheesy, or creamy, which makes it popular as an ingredient in cheese substitutes. Gluten free it’s also a good source of protein and vitamin B12. Available from health food stores and online via Amazon. What do you eat with nachos? Disclusre: This post contains an Amazon affiliate link. It costs you nothing however if you do buy anything after clicking the link then Amazon will pay me a small amount in comission - so thank you in advance if you do! I love Nachos but I'm never a fan of the cheesy stuff they put on them. Love your vegan dip: sounds like my cup of tea :) Thanks for joining in with #FreeFromFridays. Just reminded me that I wanted to buy some nutritional yeast - so I've clicked through from your link. Love the idea of this recipe and know my daughter will love it! This looks really good! Looking forward to trying your recipe! Will definitely be sharing the recipe w my friends and family!